Remember this beauty look? 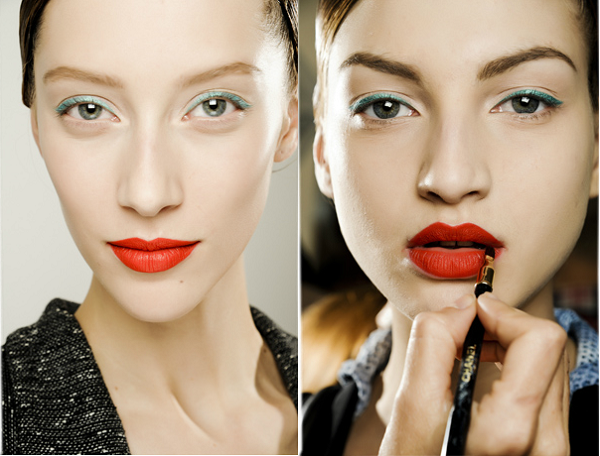 It's from Raf Simons for Jil Sander Fall 2011, and was so popular when it debuted that beauty editors immediately declared it one of their favourite looks from the season's runways. It was certainly my favourite—I even blogged about it—and to this day remains one of the most memorable. Season-less, classic, modern. The man behind this look is makeup maestro Peter Philips (formerly of Chanel), who just joined Dior makeup as creative and image director yesterday. It seems like kismet that the person who created one of my favourite beauty looks ever is joining the same brand as the designer for whom he created them. Philips has a knack for runway beauty that's striking yet wearable, looks that are closely watched and sometimes painstakingly re-created by beauty lovers. I can only imagine what innovative things he'll do at Dior, a label whose products I've come to regard very, very highly. I think it's the jade liner that really sets it off!